Mike Ragogna: So. Koz. Summer Horns II. What, Summer Horns I wasn’t good enough for you? You had to do another? Dave Koz: We live in an era of sequels, Mike. [laughs] When you look at it, some sequels are actually better than the first one. I can’t vouch for that yet because I’m too close to it, but I can tell you that we had the time of our lives making the second album. About five years had passed since the first one and it seemed like we really just scratched the surface of the available songs to us. We recorded, I think, twelve songs the first time out and we had to choose those twelve from maybe a couple hundred songs that were appropriate for that album. This gives us another shot to mine that field a little bit more and do some more songs. Plus the lineup changed this year so we finally had the opportunity to write for some brass–trumpet and trombone–which gave the Summer Horns a completely new sheen. It was a whole lot of fun, we had a blast doing it. MR: Because of the choice of material and the lineup changes, do you feel this album is a big jump from the last one? Did everyone learn something from the project? DK: I feel like any time you do something for the first time, there’s that inspiration of, “We don’t know where this is going, let’s see what happens.” That was what the first record was about. “Let’s try this.” There was a very obvious idea to keep it just saxophones to give it a unique sound for our first time. In full disclosure, this year, Mindi Abair was doing her blues project with the Boneshakers and she wasn’t available to tour. I know it wasn’t an easy decision for her but she had to say, “Look, I have to sit this one out.” The fact that she said that kind of gave us all an opportunity to look at the new project and say, “Well what do we want to do with this? We’re going to change the lineup because we have to, do we want to add brass?” I started talking with Rick Braun and he was really into it, and I’ve been doing a lot of work with Aubrey Logan. She’s been on our cruises the last couple years, she an incredibly talented trombonist and an amazing singer. It started to take shape for the first time, that Summer Horns could be a real horn section with brass and saxophones. That got us all very excited, because when you have that power, when you have the brass in the mix, it sort of gives you more license to do a lot more with the sound and the repertoire. Then it became a real fun process of deciding which songs we wanted to do and tackle for our second project. We have Gerald Albright back, Richard Elliot back, and myself–we’re the three saxophone players. Then we added Aubrey Logan and Rick Braun. Rick Braun produced the album, so it has a very significant punchiness to it. It’s got a lot of that raw, unbridled power. I think when you have that horn section, that sound that everybody loves and has been part of on so many hit records over the years, when you’ve got that represented, it’s almost like you have to really try hard to screw it up. You get great writers for some great arrangements and then you’re off to the races. That’s exactly what happened. MR: Tom Scott contributed some arrangements including the Natalie Cole track, right? DK: He did four songs and Greg Adams from Tower of Power did three songs. Gordon Goodwin did two this time, Rick Braun and Nick Lane did one and Gerald Albright did one. The arrangements…if left to our own devices it would be chaos. In order to have a great horn section, you have to have great notes to play. These guys know how to write perfect horn charts. They almost played themselves. MR: To me, the percussive nature of the horn section might be the biggest difference between these two albums. DK: I think that’s a very accurate description of it. I also think that because on the first album, we kind of kept towards a late-’60s to late-’70s era. This album kind of allowed us to be much more broad in our repertoire choices. You have much newer music like Gloria Estefan and Miami Sound Machine’s “Conga,” which I’ve always loved. It’s one of the greatest horn charts ever. Getting a chance to recreate that and also having Gloria sing on that was huge for us. So much of this stuff is hallowed ground. You take these things and say, “Let’s try something like “This Will Be,” Natalie Cole’s classic. It’s perfect, it’s a hit song, so it’s taking a big chance to recreate something that’s absolutely perfect, but that’s the dance that we have to do, the tightrope walk that we always have to do when recreating music that’s already been a hit. How do you remain respectful to the original and how do you change it enough so that you bring something new to it? I think we found the right tone with this album. MR: I especially appreciate the chances you guys took beyond expanding the horn section, for example, the opening medley that has Earth, Wind & Fire’s “Getaway” going into KC & The Sunshine Band’s “That’s The Way I Like It.” If you think about the concept, that shouldn’t work, yet it not only did, but it also foreshadowed the album perfectly. So how did you come up with the concept of combining those two songs and why did it work? DK: You’re right, it shouldn’t work. It doesn’t look right, but it does. For me, I think the glue is the horn section. Both of those songs had a very significant horn section to them that made those songs really work. Of course, every Earth, Wind & Fire song has a horn section, that’s the fuel that gives the fire to that sound. But the same thing can be said of KC & The Sunshine Band. I’ve been a fan of KC & The Sunshine Band for years. I’m always raising my hand to do one of those songs. This was one of those ideas that we just had in the process of coming up with the material. I think we listened to them back to back and we were like, “These are kind of the same tempo, they sort of feel like they could go together, though one is more of a disco thing than straight up funk. But if we got the right arranger who saw what we saw, maybe this could work.” That’s exactly what happened. This guy named Chris “Big Dog” Davis did the arrangement. I think the brilliance lies in the work that he did in finding the common ground between these very disparate songs and making them work as a medley. We did the same thing with “Take The ‘A’ Train,” the classic Duke Ellington song, which we combined with a song that was made famous by Jay-Z called “Roc Boys,” which is actually a sample of another song that had a horn section. He found this very obscure horn section and built a rap around it. I heard that song and I was like, “Oh my God, this is awesome and it’s really cool and contemporary.” Then I believe that it was Rick Braun’s idea because he thought about doing “…’A’ Train,” and he was like, “Well, what about combining “…’A’ Train” with this song,” which was the Jay-Z song. It was John Burke, our record label representative, who came up with the idea that if we do that, we could just call the album From A To Z. You can have these ideas all day long, but somebody has to actually figure them out musically. I’m not that person. I play the saxophone. I can come up with ideas but I’m not the arranger that makes it happen on the front line. We had the best of the best who came up with these ideas, like on “Route 66,” that’s Aubrey’s arrangement that Gordon took and went with. You couldn’t expect that to work on this album but there it is. It works. MR: Koz, for most of your career, you’ve been a solo artist, but I imagine you must get a lot of fulfillment from playing with a big horn section, no? DK: There’s something that’s very addictive about playing in an ensemble. You have to remember that all five of us grew up playing in big bands or even concert band. For me, playing in a sax section or a horn section… Some of the earlier parts of my career were about doing sessions and playing in horn sections on albums. There’s an ensemble kid in all of us that’s still there very prominently. I don’t think any one of us is looking at Summer Horns as a replacement for our solo careers, but every five years or so, if we’re lucky enough to do an album, it’s kind of like a nice little break and a chance for us to realign with that earlier part of ourselves where we weren’t solo artists yet, when we didn’t even have in our brains that we were going to become that. We were section people, we were part of an ensemble, part of a group. When you have your voice, you know that your voice is meaningful to the whole and you can show up and be the best ensemble player that you are, there’s a great pride that comes from that, in being part of something that’s much bigger than your own individual voice. That’s what happened in the studio on both albums. We haven’t done this on tour yet but I know it happened on the first Summer Horns album tour where we created this sound live that people freaked out over. They were like, “I’ve not heard that sound before.” Four saxophones coming out there and blazing. I’m sure that this is going to be even more powerful because we have the brass component. I think for all of us, it accesses a different part of us that we love and we don’t get to share very often. And–this is perhaps the most important part–I freaking love all those people so much. We are great friends. When we come together, we’re coming together to support each other and to make the best experience for the whole. I don’t think any of us looked at it from an ego standpoint. MR: To your point, about being friends, you’ve played on so many cruises together, so many tours together, so many records together, that I imagine its easy to anticipate each other’s musical moves, even like having a collective language. DK: Yeah. We had a conference call earlier today to talk about our rehearsal schedule coming up and we have to memorize all these parts, which is not easy. That’s the hardest part, memorization. But in just talking with the guys, there is a shorthand. There is a complete respect and appreciation for each other’s input. This is about as close as I’ve ever been to actually being in a band. I make the decisions on my own all the time, although I do love to be more democratic with my bands. But this is one where I want everybody’s input because everybody’s so great. Usually, it would just be me, and that can be lonely sometimes. But now we’ve got these players, Aubrey being a new artist on the scene. She’s maybe thirty years old with an unbelievable array of talents. She’s the only person that I’ve ever met who can actually do cartwheels with a trombone, so go figure. The guys, Gerald, Rick, these are the Mount Rushmore of contemporary jazz artists. MR: You all perform on many cruises and concerts, which has its own demands. But for From A To Z, did you test the material on the road or sea a little before recording it? DK: We did do that. We didn’t have Gerald on this year’s cruise that just finished but we did have the others. In my show, I did a couple of the Summer Horns songs that went over great. It was a fun thing to test drive them and see what kind of reaction they got. Specifically, the one that got the greatest reaction was “This Will Be,” because Kenny was on the trip with us so he sang it with one of the background singers. That just kills. It’s a great song and people haven’t heard that song in a long time. It’s so different from Natalie’s version, yet the song is still there, fully and completely. So that was really fun. MR: And what about playing the album in actual live performances? DK: Until we actually start taking this on the road, we don’t know. That’s the exciting and terrifying aspect of putting a new tour together. Until we play a show, we have no idea what we’re doing. We’re just operating on instinct. MR: Since you’ve expanded the horn players going from SH I to SH II, with Summer Horns III, are you anticipating adding woodwinds, maybe some strings? DK: [laughs] I have no idea! We’ll have to cross that bridge when we come to it. None of this was ever planned, Mike. We did a record and we did a tour, that was all we had done. I’d say probably about a month into the first tour in 2013, we were on a bus somewhere and the four of us were sitting in the front lounge and I said, “Do you guys want to do this again next summer? I’m having a whole lot of fun on this.” I wasn’t sure if I was the only one having fun. Before five minutes went by, everybody committed to the next summer. This was before any of us had any gigs, and before we were even halfway through the first summer. I think everybody really enjoyed the process. It kind of laid dormant for a while until it seemed like it was time to do another one. I made the calls and everybody jumped at the opportunity. So we’re going to do this tour and hopefully, it will do well and then we’ll see where it takes us for the next go-round. Who knows…maybe we’ll get another summer out of it or maybe we’ll do another record in a few years. 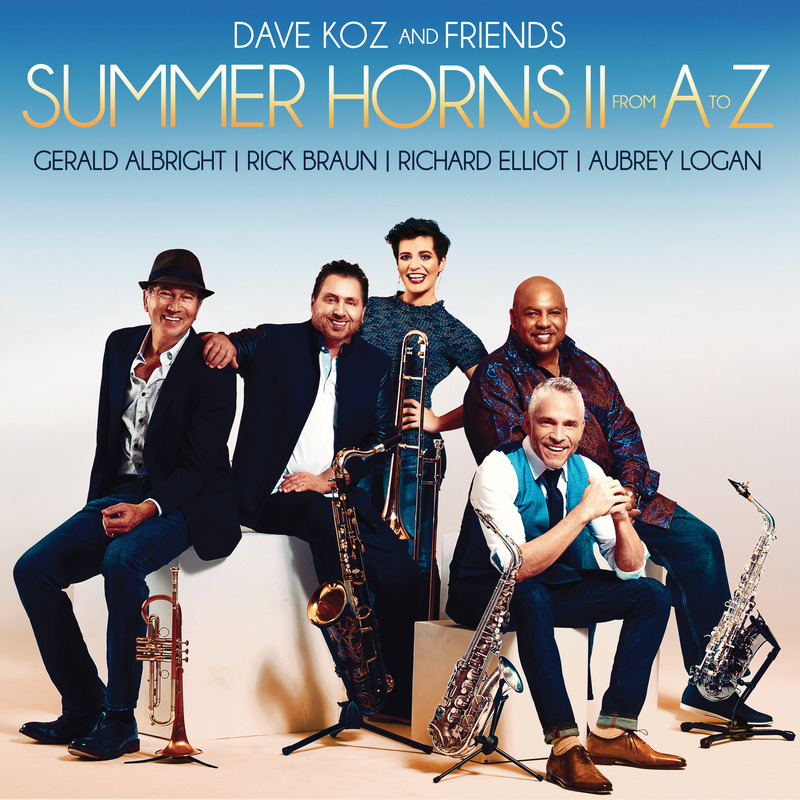 MR: Marketing thought: Get your label to fund a Blu-ray of the live shows, and maybe get Mindi back so the concept could be a combo of Summer Horns I & II material. DK: Right! It’s a good idea and we’re going to definitely do some of our repertoire from the first album with this configuration for sure. Some of the songs are just so good, you’ve got to do them. MR: Out of all the songs, which ones resonate with you the most? MR: Now that you’ve combined “…A-Train” with Jay-Z, does that open the door for recording a whole project blending old and new on each track? DK: Yeah, I think it does, and I think it’s already set. If you listen to a lot of a rap music–and I don’t listen to a lot of rap music–but the stuff that I’m drawn to is the music where there’s a lot of respect for jazz. There’s a good number of rap and hip-hop artists who have genuine respect and admiration for jazz music. The stuff gets sampled a lot and put into these very contemporary recordings. I think there’s a stage that’s already kind of set for that. While it’s music I don’t really know much about, I definitely have interest in learning more. I think that’s a wonderful thing and it keeps us very relevant and vital, and rap and hip-hop music are such expressive art forms for a lot of people. I think yeah, absolutely. DK: Right now, there are really no fences. There are no bars or anything that’s separating any music from any other music. What’s exciting for young people getting into music is to not have to have the formatted-ness or researched-out style that keeps everything sort of ghettoized in terms of genre. Right now, it’s such a democracy in music that everything is available to you. There’s nothing holding you back. That’s my main thing that I have to remind myself, and when I talk to other young musicians, it’s to explore. Be an exploration master. Don’t just stay in your box. Get out of your box. Explore everything because everything can work together. There’s one thing that I’ve learned as a collaborator: If you have open minds and open ears, you can make anything work. “Getaway” and “That’s The Way I Like It.” Come on, baby! MR: Koz, you’ve branded Christmas, you’ve branded Summer, what’s next? DK: Can we do anything in Fall? I’m only kidding. We’ll see. I might want to rest in those two other seasons. But it’s fun. I’ve got no complaints, Mike.